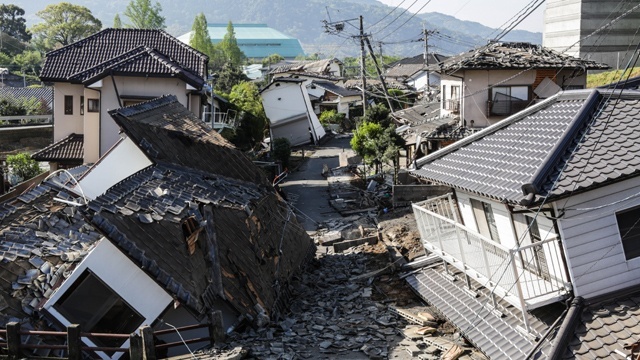 On April 14, an earthquake the magnitude of 6.5 struck Kumamoto in Western Japan, the strongest since 2011, when a 9.0-magnitude quake triggered a destructive tsunami and caused severe damage to the Fukushima Daiichi Nuclear Power Plant in the Tohoku region of Japan. Less than 30 hours later, around 1:30 a.m. on April 16, a 7.3-magnitude earthquake struck the same area. Luckily, there was neither a tsunami nor damage to the Sendai Nuclear Power Plant in nearby Kagoshima Prefecture (not in the city of Sendai, Miyagi), but the two quakes claimed the lives of 49 people and injured around 3,000. With many homes damaged or completely destroyed, more than 100,000 people are in evacuation shelters scattered throughout the area. Concerned New Yorkers have several options if they want to donate to an organization that is supporting relief and recovery efforts in Kumamoto. Make sure you indicate “Kumamoto” on the memo line of your check. Please indicate “Kyushu Earthquake Relief” on the memo line of your check. Indicate Kumamoto Earthquake Relief Fund on the memo line of your check. NYJALC is a 501(c)3 non-profit organization; provide your address to receive a receipt for tax purposes. A social service organization that provides bilingual assistance in the areas of legal referrals and housing-, financial-, and health-related issues to seniors and others in the New York tri-state area, JASSI is accepting donations for Kumamoto relief until Thursday, June 30. All donations to this fund will exclusively support locally driven relief with a focus on the emergency supplies that survivors need the most: Medical aid, blankets, food, and water. Indicate “JASSI Kumamoto Earthquake Relief Fund” on the memo line of your check. In response to inquiries regarding donations to Kumamoto relief, the Consulate General of Japan in New York has posted information on its website. 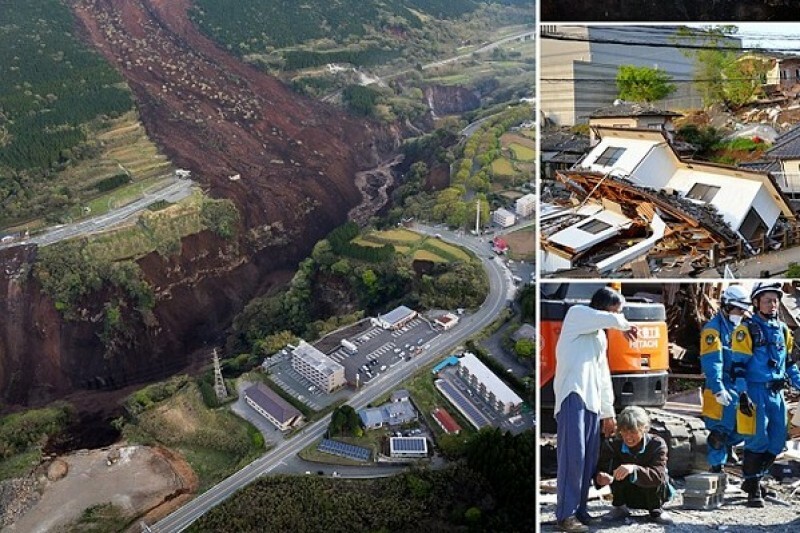 Both Kumamoto Prefecture and the Japanese Red Cross Society have opened bank accounts to receive overseas donations in the form of bank transfers. This is especially attractive to those who do not wish to make donations online via a credit card or send checks through the mail. Please note that donors may incur sending fees. For bank names, account numbers, addresses, and procedures, please visit the Consulate’s website. Events are popping up throughout the city in support of the victims of the Kumamoto earthquakes. 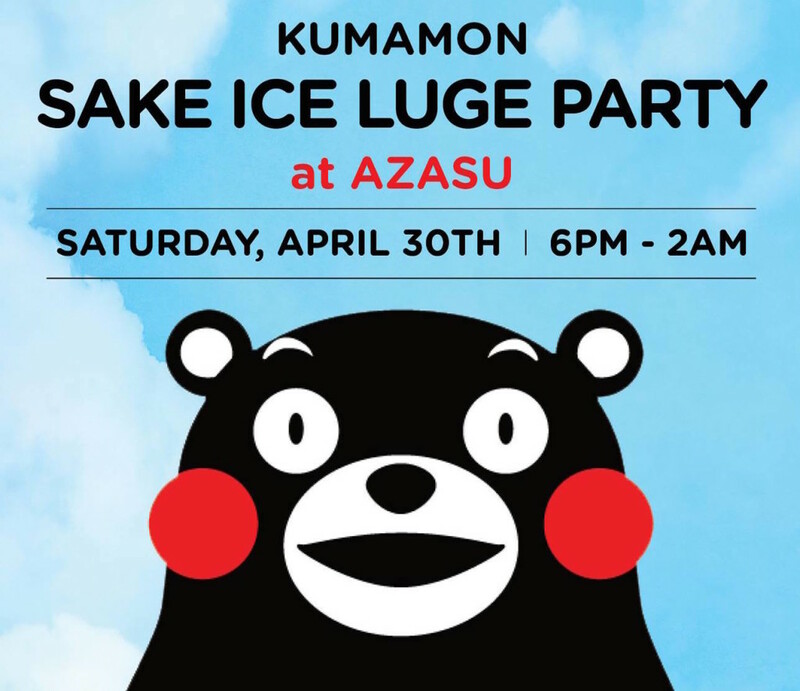 One particularly creative fundraiser is KUMAMON Sake Ice Luge Party at Azasu on Saturday, April 30. Organized by Chizuko Niikawa-Helton of Sake Discoveries, the event will promote sake made with yeast No. 9, which is also known as the Kumamoto yeast family, and feature an ice luge in the shape of Kumamon, the loveable mascot of Kumamoto, carved by Okamoto Studio. For a $1 donation, you can have a 2-ounce shot of sake; the more dollars you donate, the more shots of sake you’ll be able drink! Iwai Japanese whisky and mochi cupcakes by Red Raccoon Café will also be available. 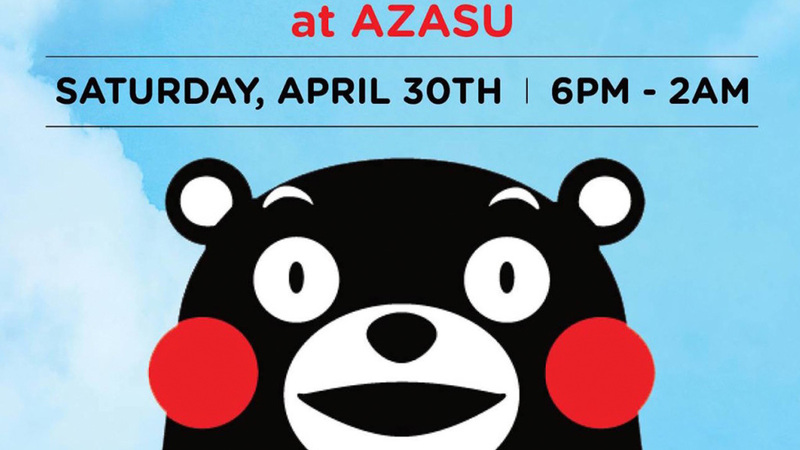 All proceeds will benefit Japan Society’s Kumamoto Earthquake Relief Fund. Saturday, April 30 from 6:00 p.m. until 2:00 a.m.
For more information, please visit the Sake Discoveries Facebook page. Kumamoto-born, Brooklyn-based chef Natsuko Yamawaki wishes she could cook for the displaced victims, including her mother, who survived both earthquakes but has been living in her car. Unable to travel to Japan, chef Yamawaki instead started a gofundme campaign in support of Cooking Ambassadors, a non-profit organization that is providing meals on the ground in the quake-ravaged area. In fewer than two weeks, Chef Yamawaki exceeded her goal of raising $5,000. Head over to gofundme to give generously before Chef Yamawaki closes the campaign. You don’t have to donate to large organizations to make a difference in the lives of the earthquake victims. Local Japanese-run business such as Sei Tomoko Salon O2 (my personal salon) have collection boxes into which you can drop a $20 bill or your spare change. If you see a box like this, give what you can, knowing it’s going to a great cause. 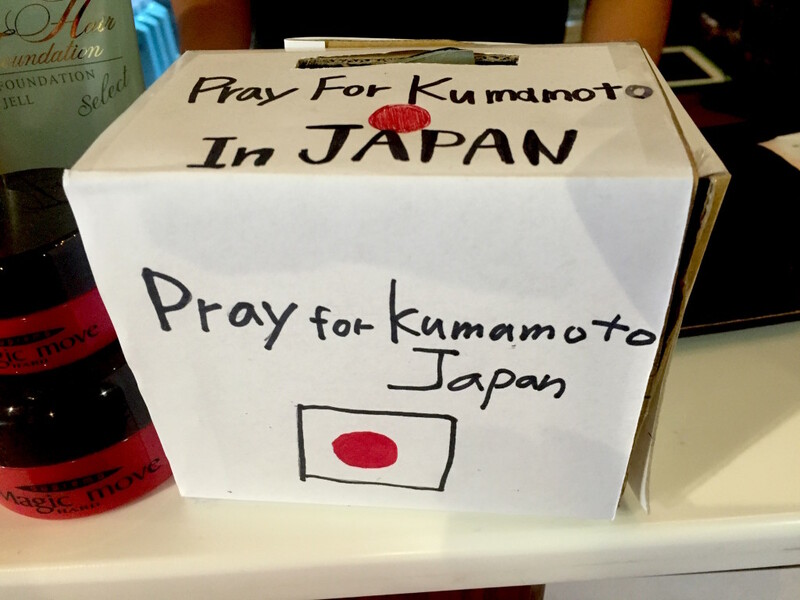 Know of other ways to help the victims of the Kumamoto earthquakes? Please send an email to info@japanculture-nyc.com.